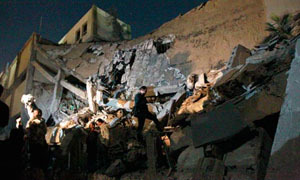 Rubble at the site of the main government building in Tripoli following an airstrike by foreign forces. The same global powers that used the force of arms to colonize Africa, suction out its natural resources and enslave millions of its people are now raining bombs and missiles down on the continent’s largest oil producer. A great irony in the vicious and yet cowardly attack on Libya is that the same exploiters and enslavers of Africa explain their most recent act of mass violence as motivated by a tender concern for democracy and freedom for Libyans. The U.S. government is at war again. How could they get away with launching another war when they tell us the country is so broke that vital public services must be slashed and public workers must be fired in massive numbers? The people of the United States are opposed to the war in Iraq and Afghanistan, and would openly oppose a third U.S. war in a Muslim country. So President Obama, Secretary of State Clinton and Secretary of Defense Gates are going out of the way to assure the country that all the bleeding will be exclusively from Libyans. When U.S./NATO forces destroyed Serbia and broke up Yugoslavia in the 1999 aerial war, they dropped 23,000 bombs and missiles on Yugoslavs and not one U.S. soldier died. As they did in the 19th century, the colonialists—who have now morphed into modern-day imperialists—bribed or coerced some indigenous elites to function as their partners and clients. Today, the so-called Arab League provided some early cover to mask the imperialist character of the operation. As U.S. planes drop terror bombs in the center of Tripoli, CIA-operated drone aircrafts are carrying out missile attacks on villages in Pakistan, and Pentagon forces are bombing the people of Afghanistan. Tens of thousands of U.S. troops still occupy Iraq after a war that took 1 million Iraqi lives. The dominant force practicing terrorism in the world today is the U.S. government, the Pentagon and the CIA. Washington's goal in Libya is to have the U.S.-backed rebel leadership of Libya's civil war take power in all of Libya or, as an alternative, to become a new governing power in the oil-rich eastern part of the country. The cheerleaders for this "democracy movement" went from right-wing Republicans to some liberal Democrats. It is a repeat of the political alignment that led to the first Iraq war in 1991 and the Yugoslav war in 1999. In this case too, they were joined by some in the U.S. anti-war movement, including some self-described "socialists," desiring to show their "democratic" credentials and wanting to accommodate to liberal mainstream public opinion. By their cheerleading for a rebellion whose leaders demanded foreign intervention, and focusing all their fire on the Libyan government, they only contributed to confusion in the weeks leading up to the onslaught against Libya. They are embarrassed about their position now that the imperial carnage is clear for all to see. The United States needs a real anti-imperialist movement—a movement that can resist the lies and demonization schemes that the corporate media churns out to justify military aggression. 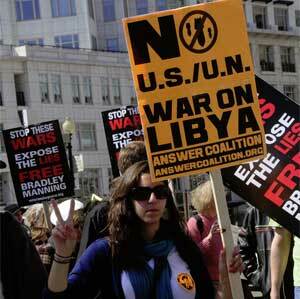 That’s why the ANSWER Coalition is mobilizing a movement in the streets that extends a hand of solidarity to the people of Libya, Iraq, Afghanistan and Palestine who have both suffered and resisted the terrorism of the greatest war machine in human history. Please join us in the streets in coming days in demonstrations across the country. Saturday, March 26 at 1 p.m. Please make an urgently needed donation to help ANSWER Boston continue to organize anti-war actions around the country. This week’s actions are emergency mobilizations and the expenses are high. Please send your donation today by clicking this link.